Two guards from the Corps of Cadets stand by a special anniversary candle and wreath at the memorial on 4/16/08, A Day of Remembrance, while photographers capture the scene. Teddy bear and wreath at War Memorial. 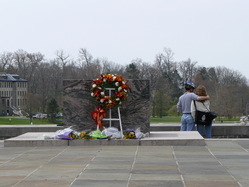 (April 18, 2007) Wreath at War Memorial. A large wreath, flowers, and plaque at the center of the memorial, following its dedication on August 19, 2007. 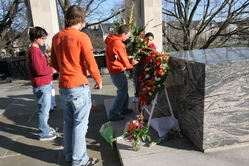 Students laying wreaths at the stone of the Congressional Medal of Honor honorees. 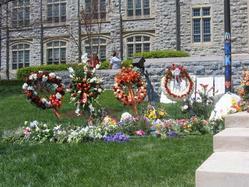 A lot of wreathes and flowers were placed besides the Norris Hall. People also wrote solace messages on the posters and set them with the flowers. People put a wreath on the wall of the Burrus Hall to remember the victims on April 20. 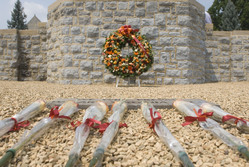 Wreath of condolences from Mason to VT.